Set the foundation for a productive and satisfying day! Ever have a hideous morning? One where your alarm ruins everything and then things just gets steadily worse? Where you’re tired, anxious, racing against the clock to start work on time? Where you start work already rattled and exhausted, feeling deep in your bones like you’ve somehow been hit by a bus? It’s not always like that, of course. Sometimes you spring out of bed and everything just seems to work. When you get down to it, how you wake up in the morning sets the tone for your whole day. I’ve learned a few lessons about this the hard way — hopefully you can learn from my experience here and reap the benefits. Here are four top tips to help you wake up happy — and start your workday alert, focused, and ready for anything. There’s no way around it: a good morning starts with a good night’s rest. Get to bed at a decent time and start racking up those Zs. Having trouble getting to sleep in the first place? A guided meditation right before bed can do wonders to quiet the mind for better rest. Good sleep is crucial, so no interruptions — and that includes beloved pets. The cat must fully cooperate! When I went on holiday one time, my mother looked after my cat. I came home to find the cat had learned to expect breakfast at five every day. It was appalling. Finally, I had to put a stop to the early wakeup calls, so instead of feeding her at five, I started putting her outside. After a few days of this, she decided that she was happy to sleep in until I got up, and we were both happier for it. Not being a parent, I suspect it may not be acceptable to do the same to children. But what I do know is this: protecting your sleep is vital if you want to wake up ready to face the day. Breakfast is the most important meal of the day, right? Actually, maybe you could do without it. I used to start my day the way many office workers do. I stayed in bed for as long as I could, then scrambled to eat as much breakfast as I could manage in the three minutes I had before leaving the house. This breakfast had nothing to with being hungry; I just knew it was my last chance to fuel up until lunch. Then I ran to duel with peak-hour public transport. This is a routine where every moment feels jarring. When you start your day like this, you’re sabotaging your enthusiasm for the whole day. 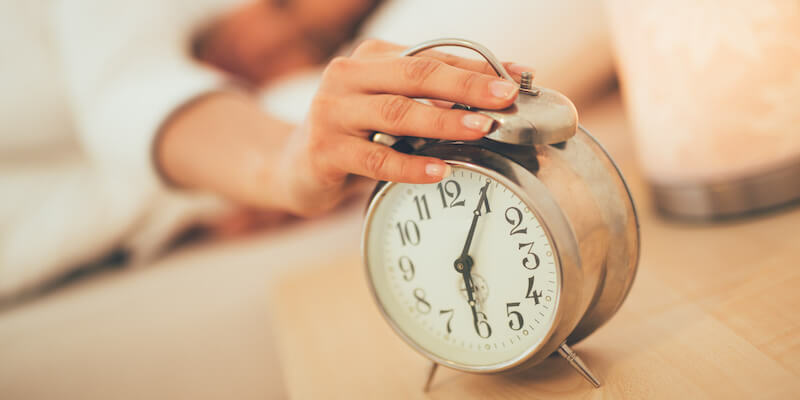 By launching your day feeling rushed and harried, you consistently train yourself to resent that you have to get out of bed at all — and given that willpower is a limited resource, do you really want to deplete your stores before you’re even out of bed? These days I get out of bed at about the time I wake up, which is well before I have to. After a few morning stretches, I get on the computer and start work. Later on in the morning, I’m more than a bit peckish — so I’ll have a relaxed snack after having already done some work. The real point is not to make the morning a rush, an ordeal, or a war on your body’s natural rhythms. It’s so much easier to leap out of bed when the very next moment isn’t an anxious rush. If morning starts with force feeding and a panicked eye on a ticking clock, you’re twisting your own arm to hate work days. The energy and attitude you create in the early part of your day is the one you bring to work. How great is coffee? It’s got it all: the aroma, the flavor, the warmth and texture, and that kick to pick you up when you’re flat. But you’ve got to remember this: Coffee is a powerful drug. That’s not to say it’s bad — used judiciously, it’s a great drug. But just as with any ongoing drug habit, overdoing it makes your life worse. The temptation is to reach for it every tired moment. Too much coffee leaves you wired in the evening. You sleep poorly and wake up worse. Starting the next day tired means you’ve got to do it all again, and the day after too. You’re swimming through a sea of black tar just to get the weekend. You’re more and more edgy, and every stress weighs more heavily. If you’re losing your focus or yawning at your desk, it might just be time for a short break. Try going for a short walk and getting some fresh air. Make the right decision at 3pm on a dull Wednesday afternoon, and it could positively impact your productivity all day Thursday. How long is your commute? I work for myself, and my bed is exactly 13 steps from my computer. While I enjoy not being stuck in traffic every morning, it’s unfortunately true that working at home can murder incidental exercise. That walk to the bus stop or up that flight of stairs might not quite be a marathon run, but it’s something. It gets a bit of blood moving. Without it, you’re liable to feel sluggish and moody. If you don’t have time even for that, you can always find a few minutes for “deskercises” you can do to wake up before you get started with the work day. Skipping exercise feels easiest on the mornings when work’s piled high. In truth, this is exactly when you need a proper flow of oxygen to your brain and a whack of those mood-balancing endorphins the most. Whether you hit the gym for a morning workout or laps at the swimming pool, walk the dog, or even just pop out to pick up some groceries, make an effort to get moving in the a.m. It will help you wake up more fully and focus throughout the morning. We only get a finite number of days on this planet, and most of us spend a fair number of them working. You deserve to tip the odds for good days in your favor. Prime yourself to make the most of the day to come, ready to handle any stress or challenge the world throws at you. James Mawson is a web marketing consultant from Melbourne, Australia. He combines a love of lively, direct, vivid and engaging language with hard-won experience and understanding of traffic and conversion strategies, and of the digital economy more broadly. He applies the Oxford comma with reckless inconsistency, leading some to dub him "the wild man of grammar." By day, he operates the Handsome Genius web marketing consultancy, providing advice and content to a select group of discerning clients. In his spare time, he enjoys craft beer, heavy metal and nachos.